At the Urban Cottage, this truly is the most wonderful time of the year (and yes, that melody was running through my head as I wrote that). Breaking out my Urban Cottage Pumpkin Spice Blend is a sure sign that pumpkin season has arrived! Autumn is upon us, in all its glory: the relief from summer’s heat and humidity, with pleasantly warm days and crisp evenings (with nary a snowflake requiring shovelling); the golden quality of the afternoon light; and, all the rich colours and flavours of the fall harvest, as we move from the bright greens and exciting fare of summer to the range of autumnal ochres and the comfort of root vegetables. The season also brings Thanksgiving, which is almost upon us here in Canada, coming as it does on the second Monday of October. It’s the holiday that has the deepest meaning for me, with its focus on gratitude for all that we have and that sustains us. And, pumpkins! Let’s not forget the pumpkins. In my home, when there are pumpkins and holidays, there is pumpkin pie. It’s one dessert that everyone in the family enjoys, and it’s a requirement of the traditional Thanksgiving dinner (from which I’m forbidden to deviate, by the way). Pumpkin on its own is not a tasty thing, but mixed with the right amounts of sweetness and spice it’s something to celebrate. Over the years I’ve come up with my own pumpkin spice blend to give my pies and other pumpkin delights their signature flavour. I know there are pre-made blends on the market and if you find one that you really like, I take no issue with you using that. 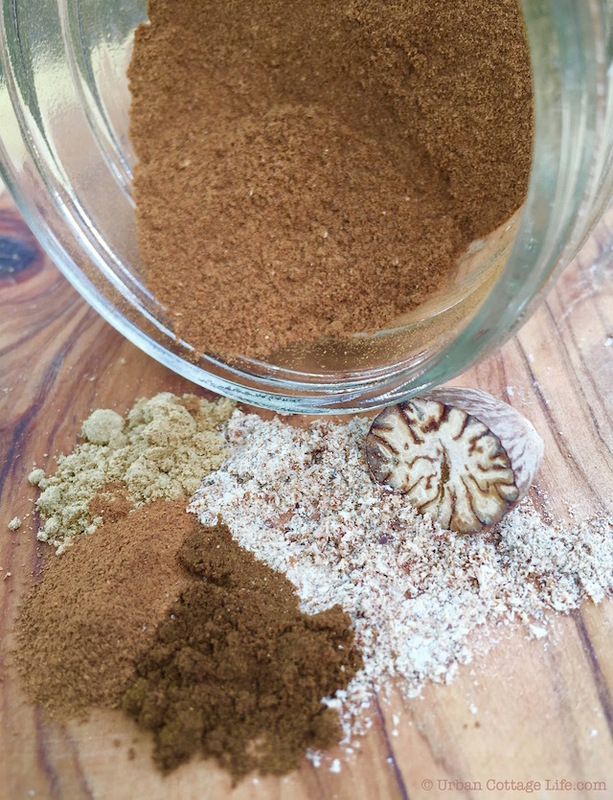 But it likely won’t surprise you to hear that I prefer to make my own pumpkin spice blend, one that has my favourite spices — cinnamon, ginger, nutmeg and cloves — in just the right proportions to suit my taste. Sometimes I just measure the spices directly into a recipe as needed, but at the beginning of pumpkin season I like to blend up a jar so it’s readily available for use whenever the pumpkin fancy strikes. Blending my own pumpkin spice allows me to create the flavour that evokes memories of many special occasions for my family, only takes a few minutes and fills the kitchen with the fragrant promise of good baking to come. It’s a satisfying modern scratch touch that’s yet another pleasure of the season. Ensure that the spices you’re using are as fresh as possible. When it comes to nutmeg, I always grate whole nutmeg as needed, as it tends to lose its potency quickly. This recipe makes enough to fill a 125-ml mason jar. Place all the spices into a small bowl and blend well, then decant into the mason jar. Store in a cool, dry place. Looking for Recipes Using Pumpkin Spice? You’re in luck … we just happen to have a few treats that use what may be Urban Cottage Life’s most popular spice blend! Check out Pumpkin Spice Granola, Pumpkin Oat Muffins and Pumpkin Maple Bread Pudding with Sweet Pumpkin Butter Sauce. how interesting . learn something everytime. I’m glad to hear that Suzanne!